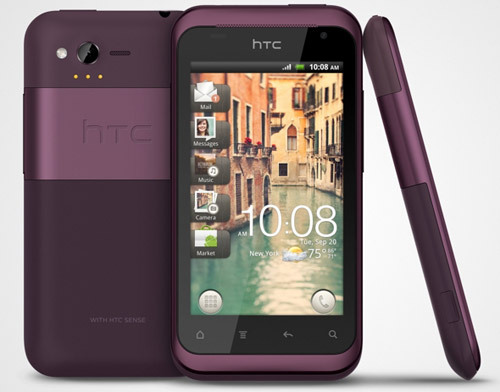 Verizon has officially announced the HTC Rhyme today, an Android smart phone which obviously caters to the female crowd. Running Android 2.3 Gingerbread, the phone previously known as the Bliss, features a 3.7-inch (800×480) display, 1GHz processor, 5-megapixel camera, and front-facing VGA camera. As initially uncovered all the way back in May, the Rhyme comes with a charm cable which lights up and notifies the user of calls and texts. If you’re thinking this sounds like a mid-range Android handset then you would be completely correct. Verizon plans to start pre-sales of the Rhyme tomorrow, September 22 with a $199 price point. While the price might sound a tad high, consider that it comes with the Docking Station, Tangle Free Headphones and Charm in the box (U.S. only). The full-on release is scheduled for September 29, a date we’ve long anticipated. Whereas the carrier plans to offer a Lavender model of the phone, Target will be an exclusive retailer, offering a Plum variation. HTC Rhyme Docking Station – The Docking Station simultaneously recharges the phone while turning the Rhyme into an alarm clock and music center so you can wake to your favorite songs played directly from the built-in Bluetooth capable speakers. HTC Rhyme Charm – The Charm is an innovative approach for discretely alerting you to incoming calls or messages while the HTC Rhyme is deep in your bag. The Charm is a small light-emitting cube that attaches to the phone by a cord that can dangle from your bag and also be used to quickly pull the phone out of your bag. It also makes it easy to find your phone buried in your cluttered purse or backpack. HTC Rhyme Sports Armband – The Sports Armband allows you to work out in style while keeping your apps and music close to you. HTC Rhyme Tangle Free Headphones – The Tangle Free Headphones take the hassle out of listening to your favorite music. HTC Rhyme Bluetooth® Headset – The wireless headset follows the same design cues as the phone itself and enables for easy hands free use. HTC Rhyme Bluetooth® Car Speaker – The wireless speaker clips onto sun visor in your car for easy and safe driving.